The musical opens with Little Edie preparing for her engagement party to a handsome young Joseph Kennedy. Later, as recluse in a crumbling mansion, the same role is played with deliberate eccentricity by Patti Cohenour in the Seattle production. Cohenour also plays Big Edie, Little Edie’s mother in the 1940s scenes. During rehearsals, Skerritt set her accent based on what she heard in the documentary, working with a dialect coach to make the East Hampton socialite sound exactly right. “She had a fascinating way of speaking, with a sort of sing-song quality,” Skerritt said. One of the things that helps her get into character is the “just gorgeous” costumes designed by Catherine Hunt, whose work has been seen at Seattle Opera, the Rep, Intiman, ACT, and others around Seattle. 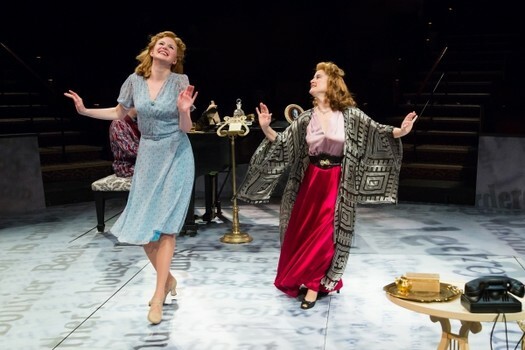 “Catherine does such a beautiful job of capturing the 1940s glamor versus the 1970s costumes,” Skerritt said. One thing that that she had to get used to was the very intimacy imposed by production’s staging in the round at ACT. “Everywhere you turn, you see the people in the audience,” she said. With Grey Gardens’ run now extended in June (“an extra week of pay is always appreciated!”), Skerritt has plenty of time to lure the audience into sharing her fascination with the character of Little Edie.